If that happens, she would suddenly find herself as one of the region’s most powerful elected officials. 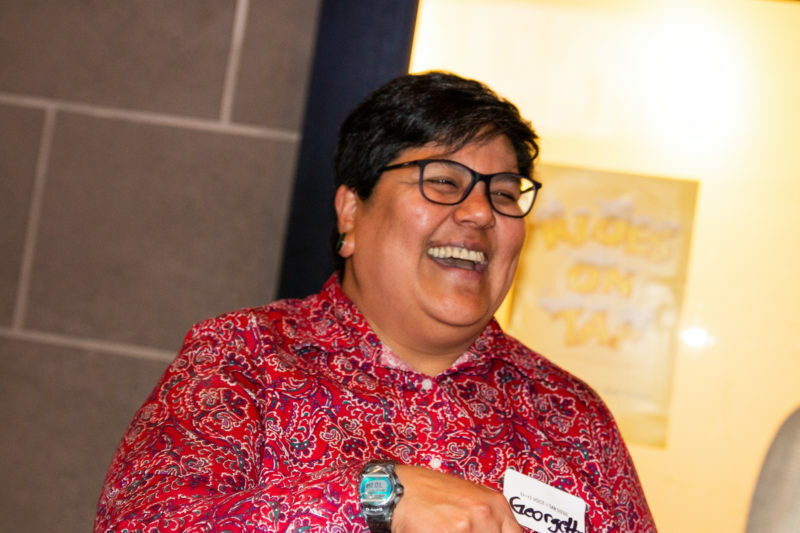 Gomez, who represents the Council district covering City Heights, Kensington and the College Area, has not been shy about indicating she wanted the Council presidency, where she’ll control committee appointments and the Council’s docket, but also have the chance to set a progressive agenda for a Council with a newfound Democratic supermajority. Last week, she confirmed she was angling for the job and said she already had an idea of where she wanted to go with it. “The opportunity that has been given, I think the voters have given something that I think if done correctly, we can truly change the narrative in San Diego and make an agenda that is community-based, that is equity-based, this is the beginning of that,” she said at a Voice of San Diego event this month in Barrio Logan. She now appears to have secured four votes, leaving her one shy of confirmation. Comments by her and other Council members suggest she could already have the votes locked up. The other veteran Democrats on the Council – Barbary Bry and Chris Ward – were expected to make runs of their own, and had already won some potential support. Jeff Powell, communications director for Republican Councilman Scott Sherman, said he thought the Council’s three Republicans could support Ward, who he said had demonstrated an independent streak. Ward, however, told VOSD he’s throwing his support behind Gomez. Unlike Ward, Bry would not say outright that she was not running and would support Gomez, but indicated she’d vote along with the rest of her colleagues and was ready to support someone besides herself. “Councilmember Bry will join her Council colleagues in supporting the Council president who will continue to move San Diego forward, and who will docket a robust agenda in order to tackle some of the region’s most pressing issues,” Bry spokeswoman Lora Fleming said. Republican Councilman Chris Cate appears ready to support Gomez too, despite their ideological differences. Councilwoman-elect Vivian Moreno – who is still hesitant to declare victory, though the rest of City Hall has already done so – said she would support Gomez, who “pounded the pavement” for her in her district. “She’s a natural leader, and I appreciate her attention and honesty to the residents,” Moreno said. That gives Gomez four votes, counting her vote for herself. And Gomez seems to think she’s got a good chance of winning support from Councilwoman-elect Monica Montgomery, who knocked off outgoing Council President Myrtle Cole in the city’s southeastern district. At the VOSD event Gomez drew a connection between herself, Moreno and Montgomery as leaders who won with community support, rather than institutional backing from organized labor or the county’s Democratic Party – and who represent the city’s underfunded, minority communities. Montgomery wouldn’t say who she was supporting but described her ideal candidate. The Council presidency selection is the first taste for Republicans of life under a Democratic supermajority. Despite being in the minority, Republicans managed to select the last two Council presidents by promising their four votes to a Democrat who, by voting for themselves, could buck the Democratic majority. In the end, other Democrats voted with the majority once it seemed inevitable, providing cover to the Democrat who made the deal, but there was never any secret that Republicans and the mayor had orchestrated the selection process. Given their current position, Republicans are having a harder time pulling off a deal. Any path for Bry would need to follow Powell’s scenario. She’d have to win three Republican votes and one other Democrat, plus her own vote. Councilwoman-elect Jen Campbell, the Council’s sixth Democrat, did not respond to a request for comment. Faulconer himself, though, has said he has a good relationship with Gomez. Earlier this year, he made a rare appearance at a Metropolitan Transit System meeting to support her becoming MTS’s board chair. County Supervisor Ron Roberts, a fellow Republican, had to abandon his bid once Faulconer did so. If Gomez indeed wins the Council presidency, she’ll be suddenly find herself second only to the mayor in her ability to affect local policy. The position would give her the ability to direct the City Council’s legislative agenda. Before he was ousted from the Council presidency by Republicans in 2014, now-Assemblyman Todd Gloria led a Council that raised the minimum wage, increased a development fee for low-income housing and passed new development regulations in Barrio Logan – though two of those measures were later repealed or scaled back when business groups collected signatures to overturn them. Gomez also remains MTS’s board chair. That could also be an influential regional position, because the agency is pursuing a measure for the 2020 ballot that would increase taxes to pay for transit improvements countywide. And thanks to recent state legislation, the Council president is automatically one of the city’s representatives on the San Diego Association of Governments. That agency is likewise at a critical juncture, as it prepares to adopt a new, multi-decade outline of the region’s transportation system in early 2020. Thanks to that same state legislation, San Diego is the most powerful city within that agency, since all votes are now weighted by each city’s population. The City Council is scheduled to choose its new leader on Dec. 10, right after the newly elected Council members are inaugurated. Gomez has the inside track, and would begin 2019 in a powerful position to shape local public affairs.